As a dance artist working with Haitian, African, and contemporary dance, I have chosen to let my practice-based questions direct my intellectual inquiry. My master’s thesis and doctoral dissertation evolved out of questions that arose as I sought to experiment with making movement and dance in an ethical way while dancing for a variety of companies and receiving mentorship from international artists. My MA work in Dance involved dancing and collaborating with company JAKA in Port-au-Prince, Haiti, and focused on the choreographies of power in women’s dance projects. This work set the foundation for my doctoral research, in which I posed questions surrounding theories of tradition and contemporaneity in relation to race and diaspora in Haitian dance, questions that arose in my artistic practices and experiences. The theoretical materials garnered from my MA and Ph.D. research became the points of original intersection for my choreographic projects in Port-au-Prince, working with hybrid dance forms and forming my dance company the CCBdance Project, which was created in 2006. The CCBdance Project is a postmodern dance company that works with a base of African and Caribbean movement as well as modern and postmodern techniques. Working with the thematic materials of travel, race, peace, translation, violence, and inter-culturalism, the company produces new works made for the stage, improvisations, site-specific installations, and dance films. I am a Jewish American dance artist, my practices and work with African and Caribbean artists have contributed deeply to my understanding of inter-culturalism. I have sought out elders’ and mentors’ advice and ways of becoming deeply connected to people and practices. These connections and practices are evidenced in the way I make work, my movement, use of music, patterns of movement research, methods of improvising, and stage presence. My philosophical views on dancemaking and authorship are also deeply informed by the work of these artists to whom both my work and person are connected. This contribution to the field is important on many levels, as it evidences important forms of inter-culturalism in which practice and race intersect in meaning-filled ways and demonstrates how culture(s) and cultural practices can be learned, transmitted, and employed in respectful ways across color, gender, geography, and nationality. Since 2000, this work has fostered long-term questions into inter-culturalism and current inquiries regarding my Jewish diasporic identity in coalition with African diasporic artists. I have begun to question how my improvisational practices show spaces of both direct unity and dissonance outside the bounds of language. This identity-based work is an ongoing thread in both movement research and in writing. My written work is currently taking shape in a series of articles which intersects issues in process, movement research, improvisation, ethics, gender, race, translation, home and elsewhere, circulation, interculturalism, contemporaneity and tradition in relation to the work of my own company as well as other contemporary and diasporic artists. 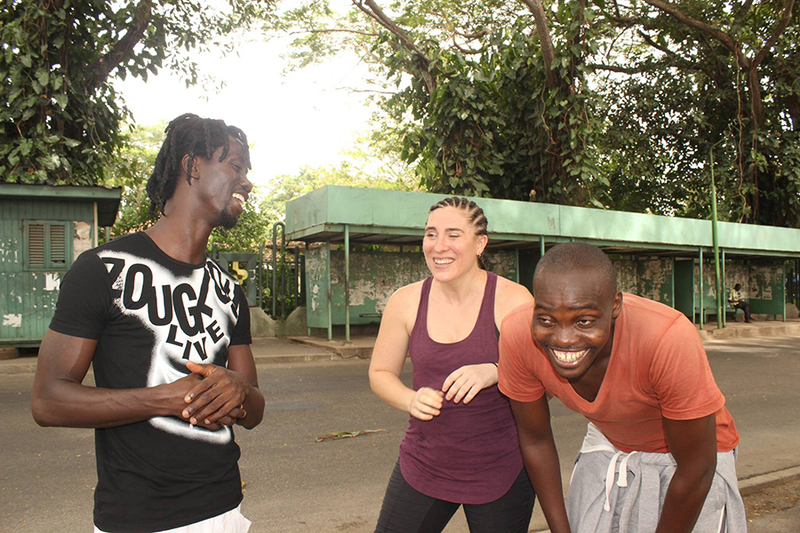 I am completing an article about the process and making of an evening length dance-work in Abidjan between 2013 and 2015 through the lens of movement research. I am also working on a piece of writing that analyzes how my Jewish diasporic identity is coalitional to African diasporic dance practices in the overlapping diasporas that improvisations manifests for me in praxis and in dance-making. I have published a chapter on contemporary dance-making in the works of women choreographers’ who have mentored me or with whom I have collaborated in Port-au-Prince in Susanna Sloat’s 2010 volume on Caribbean Dancemaking. The Journal of Haitian Studies has also published two articles addressing Haitian diasporic dance-making practices and works in 2009 and 2011. The Chicago Artist Resource and Chicago’s social justice journal Area Magazine, have published works that address my artistic work through dialogue about improvisational practices, movement research, and social justice. The Encyclopedia of Race and Racism has also published my article on dance in reference to culture and anti-imperialism in their second edition. I view my role, whenever possible, to be that of dance instigator or motivator of dialogue through curation. Working with Liz Lerman's critical feedback model, I try to create spaces as needed and with the possibilities to generate useful feedback for artists and grow audience perspectives. I began curating work in 2005, when Meg Wolfe invited me to curate an evening of Anatomy Riot at Zen Sushi in Los Angeles. In 2007, I was asked by the Dance Center at Columbia College to engage in a dialogue with Margaret Jenkins and Tansuree Shankar about collaboration and hybrid choreography. In Chicago, I began curating the Bloom series out of necessity to create a platform for artists, including myself, to share ideas about and experiments in postmodern dance forms. I also organized evenings of dance and discussion about the difficulties and challenges that face women in dancemaking in the city of Chicago. In Abidjan, as artist in resident, I curated an evening of solos through at the INSAAC conservatory so that we could talk about contemporaneities in African contemporary dance. This work has extended to university settings, where I also curate student work. My overall goals are to create safe spaces for artists to connect with others and receive critical and generous feedback on their work in diverse communities. Critical Race Theory, Diaspora Studies, Postcolonial Studies, Francophone Studies, Caribbean Studies, African Studies, Social Justice, Ethnography, the Intersections between practice and theory, Performative Writing.